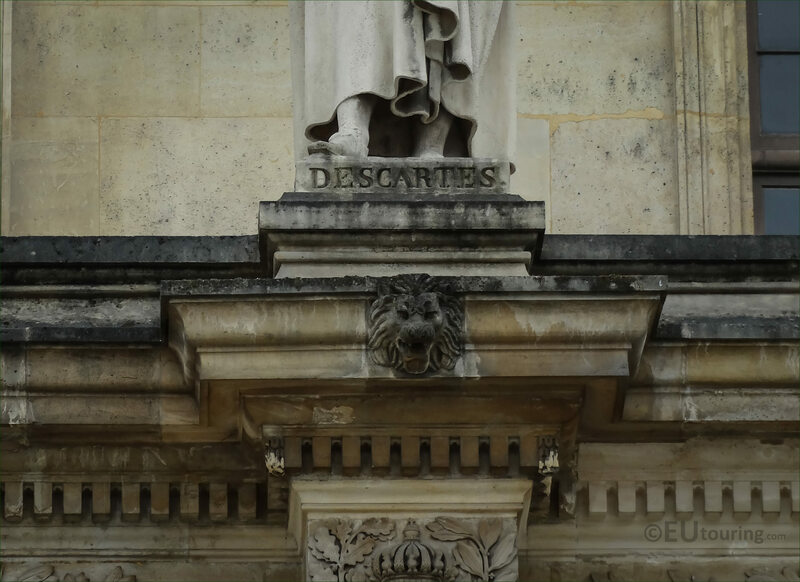 This time we were again within the Cour Napoleon looking at the facade of the Aile Daru and a statue of Descartes, which is located on a wing of the Palais du Louvre in the 1st Arrondissement of Paris. 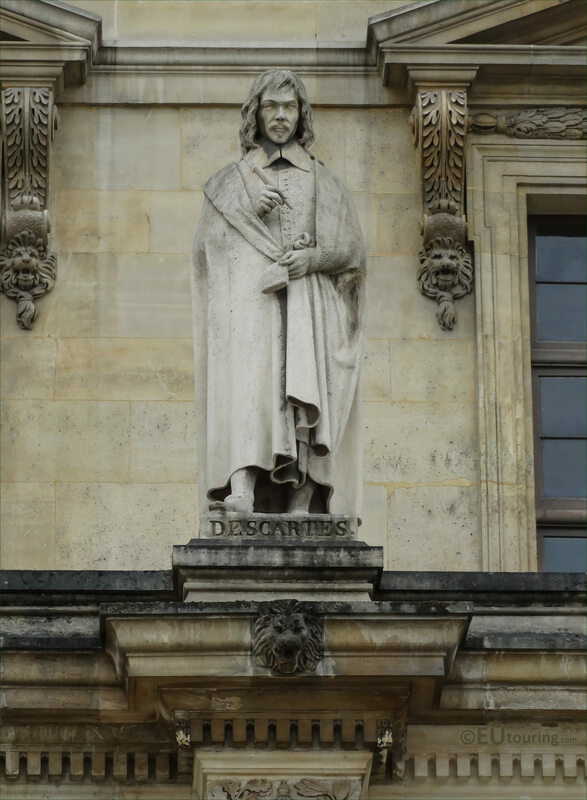 This first image shows the statue of Rene Descartes, which is positioned on the first level balustrade, third in from the left on the facade of the Aile Daru, and it was produced by the artist Gabriel Joseph Garraud, who was born in 1803 and became a French sculptor, and he passed away in Dijon in 1880, which was his home town and where he lived for most of his life. 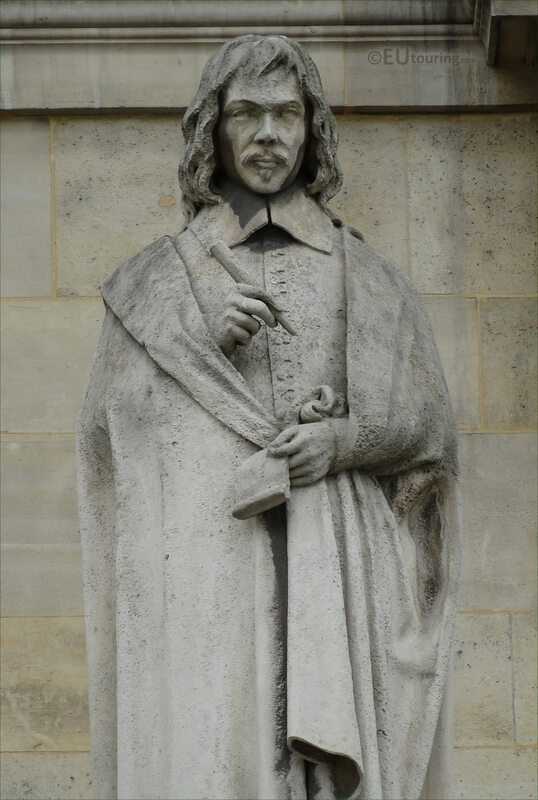 Now this next HD photo shows a closer view of the stone statue representing Rene Descartes, who was born in March 1596 and became a French philosopher, mathematician, and scientist, yet he died while in Sweden in February 1650 and one account was through pneumonia, however, there is speculation that it could have been assassination. So the reason Rene Descartes was chosen to be represented on The Louvre is due to the fact that he is classed as the father of modern philosophy, especially because of his Meditations on First Philosophy writings, which is still a standard text used at most university philosophy departments. Yet Descartes was also a mathematician and is also credited as the father of analytical geometry, which is the bridge between algebra and geometry, that was crucial to the discovery of infinitesimal calculus and analysis and the development of Cartesian or analytic geometry, many referring to him as a genius.